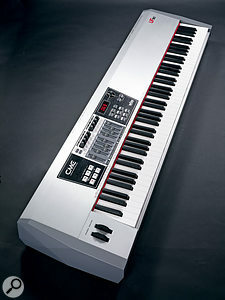 The CME UF80 offers a weighted, hammer-action 88-note keyboard at a knockdown price. Is it too good to be true? CME's new UF family of controller keyboards is comprised of four different models. The UF50, UF60 and UF70 feature 'semi-weighted' keyboards with 49, 61 and 76 keys respectively, offering velocity sensitivity and aftertouch. The UF80, reviewed here, has a weighted 88-key 'Professional Hammer Action' keyboard, which also has velocity sensitivity and aftertouch. Apart from the keyboard configurations, the different models are functionally identical. The UF80, unsurprisingly, is the largest and heaviest of the bunch, measuring 1408 x 372 x 150mm and weighing in at a daunting 23.5kg. The brushed-aluminium case gives the device a stylish appearance, and should protect against all but the most violent impacts. The top panel is adorned with nine sliders, eight knobs, a basic-but-serviceable LED display, a rotary encoder, a set of six sequencer transport buttons, and a dozen other buttons. In addition there are the usual pitch-bend and modulation wheels (the former sprung, the latter not). The back panel features a conventional MIDI Out socket, two quarter-inch jack sockets for connecting expression or sustain pedals, a more unusual eighth-of-an-inch jack socket compatible with Yamaha's BC3 breath controller (I wasn't able to test this), a standard USB port, a socket for attaching the mains adaptor (supplied, although the unit can be powered via USB instead) and a power on/off switch. There's also a blank plate, behind which lies an expansion slot that can apparently be used to install a Firewire expansion board or a sound module expansion board (see the 'Mind Expanding?' box above). The manual provides no information at all about these options, leaving the user to search the CME web site for clues instead. You have a range of options when it comes to connecting the UF80. Most simply, you can use the standard MIDI output socket provided on the back panel. Alternatively, if you're working with a computer, you can run a standard USB cable from the socket on the back panel. The UF80 is a 'class compliant' device, so no driver needs to be installed. Once attached, virtual MIDI In and Out ports (one of each) are made available to MIDI-aware applications. The UF80 also has a built-in bi-directional wireless MIDI system, and a small USB dongle is supplied which acts as a receiver for the host computer. The radio frequency and channel are adjustable and maximum operating distance is quoted as being 80 metres 'without obstacles'. No installation instructions or driver CD are provided, so I just crossed my fingers and plugged it in. My first attempt failed. My computer (an Intel-based PC running Windows XP) initially saw that a USB device had been attached, then threw up an error message saying that the device had not been recognised. I removed the dongle, plugged it back into the same socket, and it was properly recognised. A new MIDI interface (identified by Windows as a 'USB Audio Interface') immediately became available. Once installed, the wireless connection worked transparently. I wasn't aware of any perceptible extra latency compared to a cabled connection, and I didn't experience any interference or data corruption (although I'd personally still want to take a USB or MIDI lead along if I was going to try using the keyboard in a 'noisier' environment). Although it works well, I have to say I'm not entirely sure why a wireless MIDI connection is useful. This is an 88-key keyboard, weighing a little over 23 kilos; you're not going to be strapping it on and dancing about on stage! Once installed in the average studio, a controller keyboard is unlikely to be moved very far or very often. Balancing the inconvenience of occasional re-cabling against the risks of RF interference and software glitches, I think I'd favour the old-fashioned approach. A range of optional expansion boards are available from CME, and all appear to be compatible with the UF keyboard series. More information can be found at www.cme-pro.com/en/product-list.php?bc=7. Briefly, the options seem to include a piano sound module, a Waldorf 'nano' synthesizer board, an audio input board with Firewire, a MIDI Ethernet interface, and the 'ASX Advanced Synthesis Expansion card', which hosts a selection of software plug-in instruments. These expansions might add a good deal of functionality to the UF80 and its smaller siblings. It's a pity that no useful information is provided in the manual! The UF80's user manual is sadly not all that good. It's let down by a poor translation into English, which doesn't appear to have been spell-checked, and in places is quite difficult to understand. It's also brief and superficial, and leaves some features almost entirely undocumented. Fortunately the keyboard's user interface is reasonably easy to understand, so it's not too difficult to figure out the basics and get started. The nine faders and eight knobs are assigned to a sensible set of default controls, and can be assigned to new controls relatively easily. To change the control assigned to a fader, for example, press the Shift button, then hit D#1 on the keyboard (which has 'Assign Controller' printed above it), move the fader you want to edit, turn the rotary encoder until the desired controller number is shown in the LED, press the Enter button, turn the rotary encoder until the desired MIDI channel number is displayed, and press Enter again. It may not be exactly intuitive, but it's fairly logical, and quite easy once you get the hang of it. Knobs and faders can have CCs, RPNs and NRPNs assigned, allowing a good deal of flexibility. The top panel's function buttons (F1 to F6) can be configured to send note on/note off messages, or Program Change messages, on independent MIDI channels. CME have implemented something called 'U-CTRL' mode, which aims to simplify use of the UF80 with popular software applications. In practise this is an emulation of Mackie's 'MCU' protocol, as used in the popular Mackie Control range. In theory, any software which supports the Mackie Control should be accessible from the UF80 in U-CTRL mode (Reason and Logic are just two examples among many). I tested this with Reason, and it seemed to work OK. More specifically, it seemed to work when the UF80 was connected to my computer via USB, but I couldn't get it to work via the wireless connection. I don't know if this was due to some error on my part, or whether it actually doesn't work. The manual fails to provide any information at all. My first impressions of the UF80's keyboard were very positive. The keys have a nice weight, and a convincing hammer action, and feel comfortable to play. They have a little bit of 'bounce' when released, which you perhaps wouldn't find on a more expensive keyboard, but it's nothing to complain about. Overall I was impressed. The keyboard's response can be fine-tuned in a variety of ways. Ten different velocity curves are available: a straightforward linear default, various 'softer' and 'harder' curves, and three different fixed-velocity settings (which might be useful for step-programming repetitive patterns). Similarly, there are seven different curves available for fine-tuning the keyboard's aftertouch response. I did come across one noticeable glitch while playing the keyboard — it's easily reproduced, and purely mechanical. Hit a white key fairly hard and hold it, then hit an adjacent black key equally hard a few times: you'll hear a slightly alarming 'clacking' noise, as if the hammer mechanism is striking something it shouldn't be. This doesn't seem to affect the keyboard's functioning — note data is sent as normal — but it's a slightly jarring surprise the first time it happens. To be fair, it only seems to affect adjacent black and white keys (adjacent white keys are fine), and you have to be hitting them pretty hard. I think it would very rarely happen with my playing 'style' (such as it is), but if you're a more forceful player it would probably be a good idea to try the UF80 out in person before parting with any money. When I tried attaching an expression pedal to the UF80, the resulting experience was a bit mixed. At first, I couldn't get it to work at all. I double-checked that my pedal and cable were OK, and indeed they worked fine with a Zoom effects box and an Akai controller keyboard. The most common cause of expression pedal incompatibilities is polarity — the question of which of the cable's two wires is attached to the 'tip' of the jack plug, and which to the 'ring' — and this proved to be the case here. With the UF80, CME are offering a very sturdy, full-sized MIDI controller with a weighted hammer-action keyboard for a very attractive price. While there are plenty of other keyboards with broadly comparable specifications in this price bracket, almost all of them have 'semi-weighted' keyboards. If your top priority is to have an eight-octave keyboard with a pretty convincing piano-like feel, the UF80 should be on your list of keyboards to try. If, however, you're happy with a slightly smaller, more synth-like controller, there are many other alternatives to consider. UF Brain is a basic utility application available from the CME web site (although not supplied with the keyboard itself), which allows controller assignments and other system settings to be edited from the host computer — and can also be used to update the keyboard's firmware. The unit I was sent to review had firmware version 1.03. However, although there were rumours on the CME support forum of a later firmware version, none was available from www.cme-pro.com/en/support.php?type=app at the time of writing (if I understand the forum thread correctly, a later version was released, then withdrawn again as bugs became apparent). UF Brain is currently marked as version 1.0 beta, and is available for Windows only. It's not clear when CME will release a Mac version. As a basic editor it looks reasonable enough, although I experienced a few freezes in the course of my limited testing. Hopefully later versions will be a bit more polished. 'U-CTRL' Mackie Control surface emulation. Documentation is poor and incomplete. U-CTRL may not work wirelessly. The CME UF80 is a solidly built, full-sized, weighted controller keyboard, available at a very competitive price. It has one or two quirks, but it's a serious contender in its price bracket nonetheless.